Just the title of this review presented me with a problem. 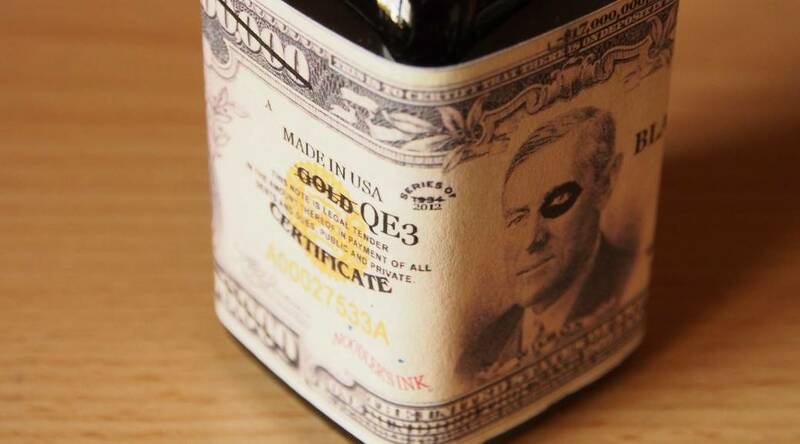 What is the correct way to spell the name of the ink? 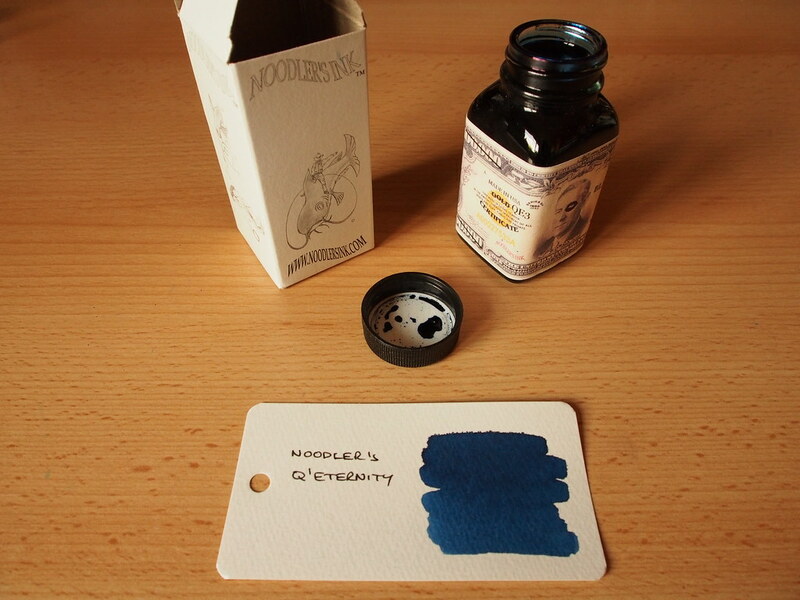 Some ink names are inconsistent and I would normally refer to the label on the bottle in the first instance, but in this case it isn’t there. Is it on the box? No – only a few symbols ($& the a third one I can’t make out). 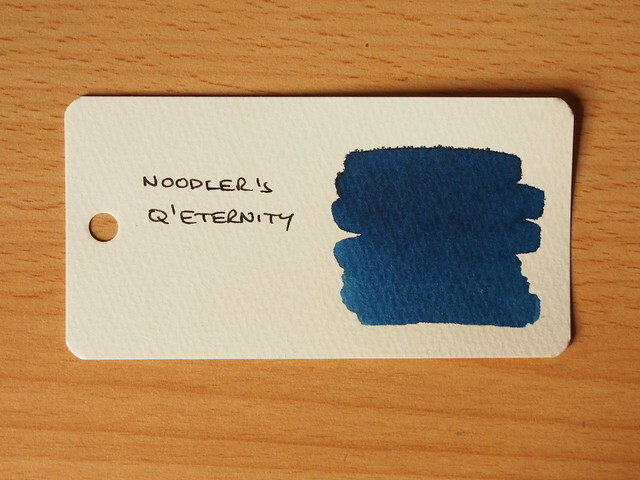 What about the Noodler’s website? It’s given as “Q’E-ternity” – excellent, but there is an embedded YouTube video immediately below and in the title it’s spelt “Q-E’ternity” (the dash and the apostrophe are swapped). On the Goulet Pen Company website it’s given as “Q’ternity” (the first “E” is lost), while on the Pure Pens website (from where this ink was bought) it’s given as “Q.E’ternity” (we now have a period). Does this really matter? Beyond affecting how the slug for this page is formatted, of course not. In the end I’ve settled with the version on the Noodler’s website, simply on the grounds that if it was wrong it could have been changed easily. Moving on. Back to the ink itself, which cost £10 for a 3oz bottle, which I would class a low cost. The 3oz bottle and box are the usual types. 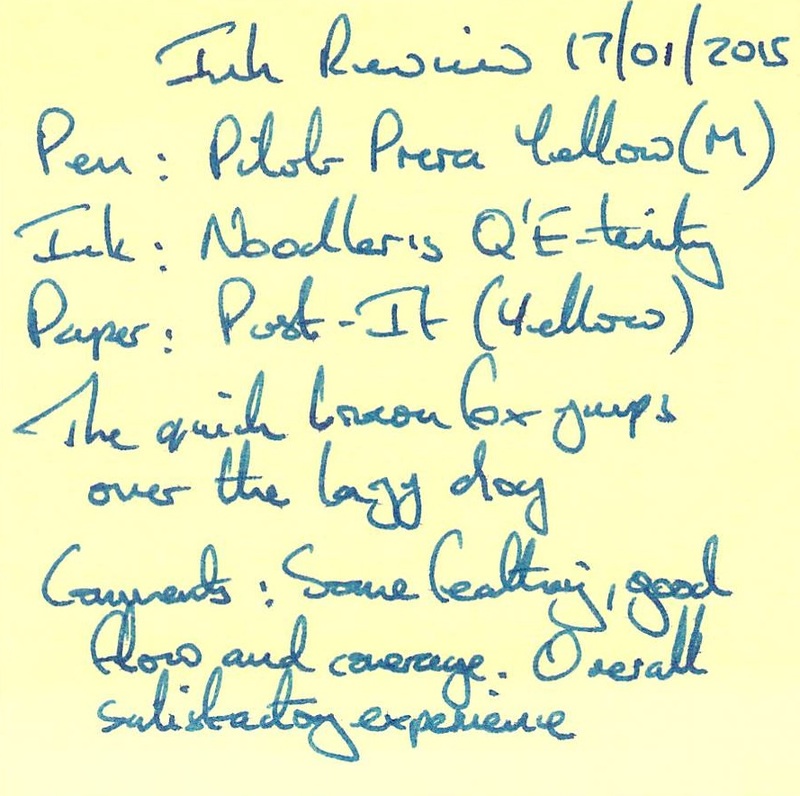 The test pen was a yellow Pilot Prera, with a medium nib. 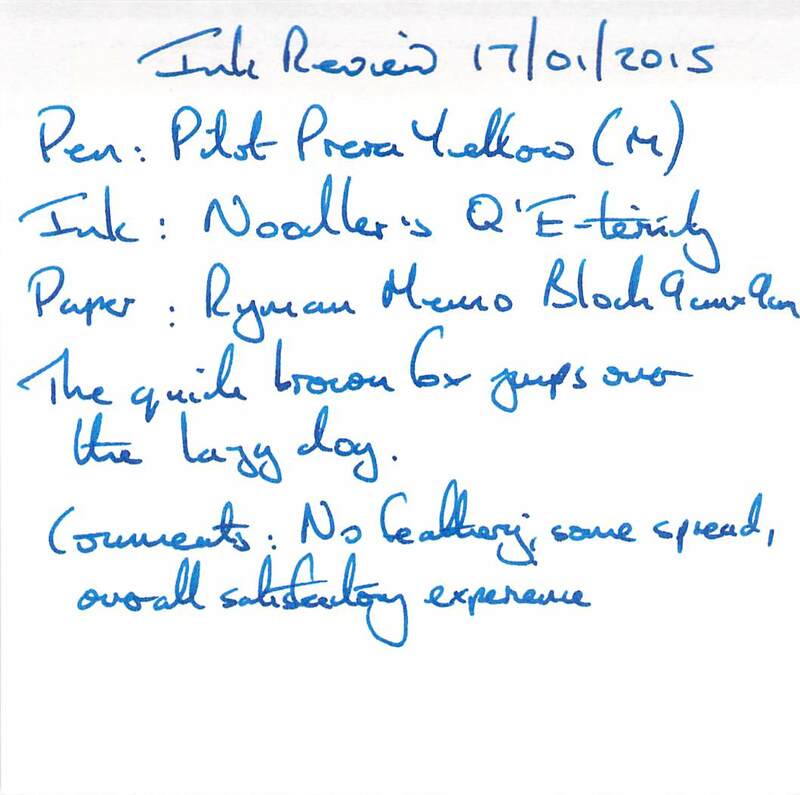 The black component of the ink showed some water resistance, leaving a grey line. The blue component washed away. Water drops obscured any text. Cleaning was easy. The dry time in this instance was around 20 seconds – still not instant, but fast compared to my usual tests. 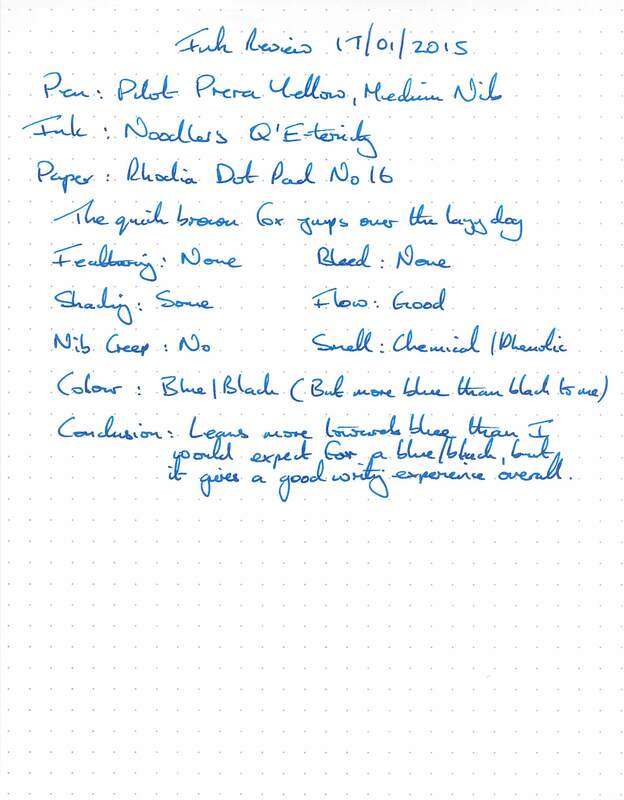 The ink performed well, and since blue-black inks don’t rank highly on my list of preferred inks the fact that this one leans more to blue is not a problem to me. Still a good experience and no feathering that I could see. Now we have some feathering but overall it’s still okay. Despite the feathering and bleed, this is still okay. Yes, I know I’ve been inconsistent with the spelling – but that’s what I thought it was when I labelled it. 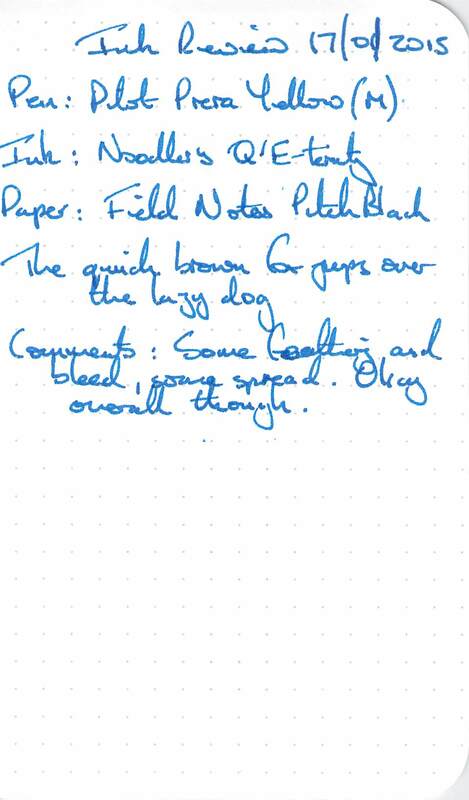 There is feathering on the top edge, but unlike Bernanke Blue this didn’t carry through onto other papers (except Field Notes). 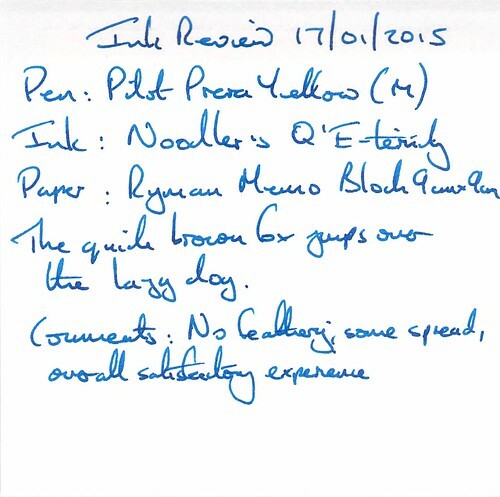 Overall I found this to be a good performing ink and I like the colour – mainly because it doesn’t look like a typical blue-black to me. I will be using it again.